I don't know about you, but one of my favourite things about winter is walking around in warm woolen socks and huddling on my couch with a hot cup of my ultimate favourite tea, the Masala Chai. 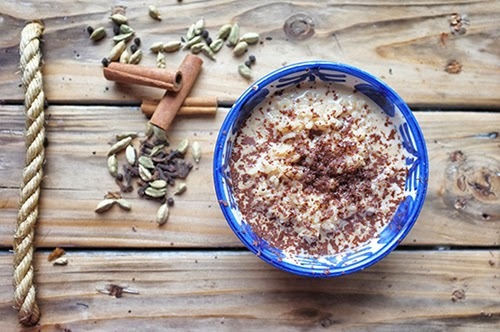 Because I love Chai Tea so much, I’m always for ways to incorporate this sweet spicy flavor into my recipe experiments: cupcakes, cookies, cakes, ice-cream... Today, I have taken it to the next level: rice porridge. * If you are vegan, this recipe can be easily adapted by simply replacing the milk with 1 l soya milk + 0,5 l almond or coconut milk. It will taste delicious! Crush the cardamom pods and cloves. 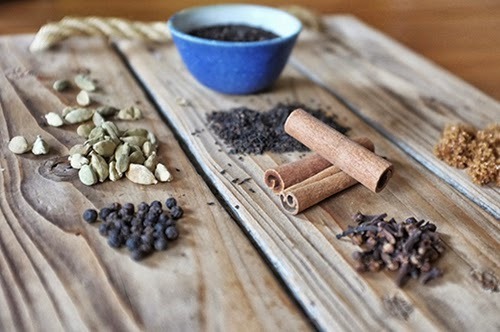 Put 750 ml of water in a small saucepan and add the crushed spices, one cinnamon stick, peppercorns and ginger piece and bring it to boil. Split the vanilla pod lenghtwise into two halves and add it to the pan. Add the milk and sugar to the pan and bring it to boil one more time. Remove from heat, add the tea and let it infuse for 15 minutes with the saucepan covered. Strain the Chai Tea mixture into a medium size saucepan. Add the rice, milk, sugar and cinnamon stick. Bring it to boil. Reduce the heat to a simmer, stir and cover. Cook at low heat for about 25 minutes or until the rice is tender, stir occasionally. There you have it, the perfect recipe to keep you warm and happy until the spring comes. What about you guys? What kind of comfort food gets you through winter?